1)Begin by showing the distinctives of Greco-Roman rhetoric. 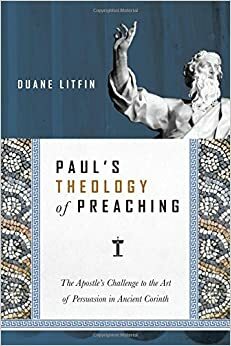 2)Show How Paul’s first four chapters in 1 Corinthians is meant to address preaching done in view of Greco-Roman Rhetoric. The fundamental assumption behind Greco-Roman Rhetoric is that the audience + the speaker’s efforts can yield a fixed Result. The result or the goal in this equation is to convince the audience of a particular position. Classical rhetoric was utilitarian and goal oriented. Paul on the other hand insisted that the equation was not a fixed formula. Unlike the rhetorician Paul did not perceive his goal to be the convincing of an audience. He insisted that creating faith was the role of the Holy Spirit. To usurp the Spirit’s role, was to empty the cross of its saving power. The first model is what Lifitin calls the natural paradigm, the second model is what he calls the Pauline paradigm. Under the natural paradigm the speaker is a persuader, but under the Pauline paradigm the speaker is a herald. The Herald does not ask “What must I do/say to achieve a specific result?” Rather the question asks “What is God calling me to be and do?” Success is the goal of the former, whereas faithfulness is the goal of the latter. This however does not invalidate the herald’s desire to speak with excellence. According to Lifitn there are 5 steps or levels within human persuasion (278): attention, comprehension, yielding, retention, and action. The herald is focused on the first two steps in the process: attention and comprehension. Thus even Paul understood and embraced the need of the herald to adapt in order to gain a hearing and communicate clearly the message he was entrusted with. There are some practical implications to this Pauline model. The most important is that faithfulness is the primary role of the minister (whether a speaker or not a speaker). Or as Lifitn says about the Pauline model: “It asks not how can I achieve some preset result? But, What is Christ calling me to be and what is he calling me to do?…. The Pauline model is obedience driven. Liftin presents a long and very detailed argument for his position. He devotes a substantial amount of text to classical rhetorical theories and a large amount of text to the exposition of 1 Corinthians 1-4. At the end he offers some of the practical implications of this study. Overall it is an insightful book, though it might better serve preachers if it were presented in a condensed form. For myself, it wasn’t a groundbreaking idea, though it was a good reminder that my call as a preacher is not to convince anybody but to work hard to communicate clearly and compellingly while letting the Holy Spirit do his work of changing hearts.